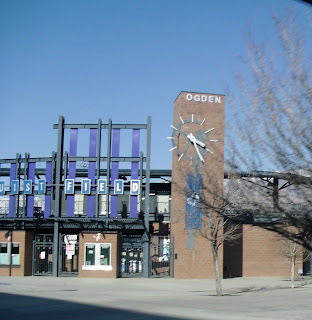 During a short break while completing a work assignment in Salt Lake City, Utah this week, I took an hour and traveled 41 miles north to Ogden, to seek out the Pioneer League digs of the Dodger affiliate Ogden Raptors. 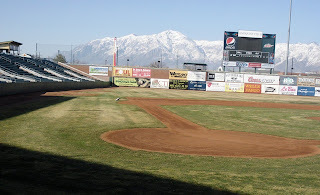 What I found on this wintery March afternoon was a picturesque ballpark dropped at the base of the Wasatch range. 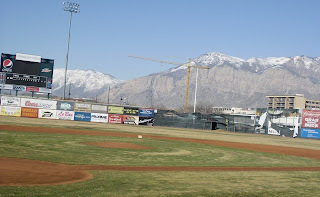 One of the most beautiful settings for baseball I have ever witnessed amongst a charming downtown setting. I didn't want to startle the maintenance man. 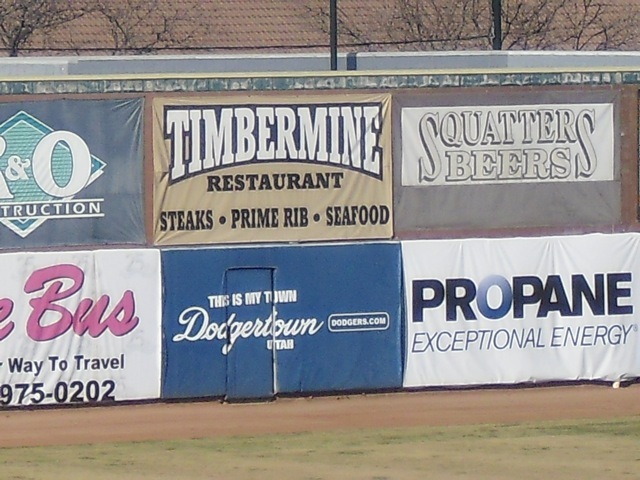 I had entered the ball park from a back entrance passing several "no trespassing" signs. Once I approached him and asked if it was alright to take pictures, he didn't seem to care at all. 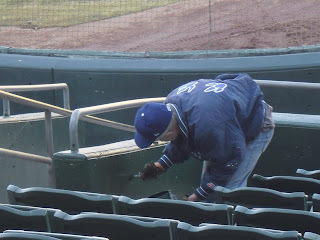 He just went about his business sprucing up the place with fresh paint. 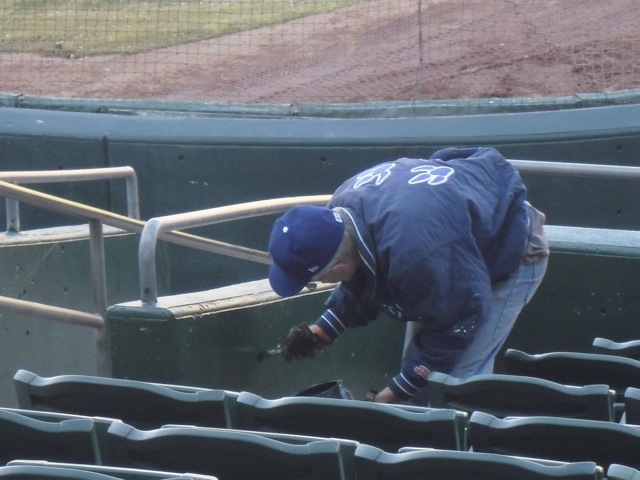 I asked if he was the maintenance department during the off-season and he said he was. A friendly man. He told me to take my time and take as many pictures as I wanted. 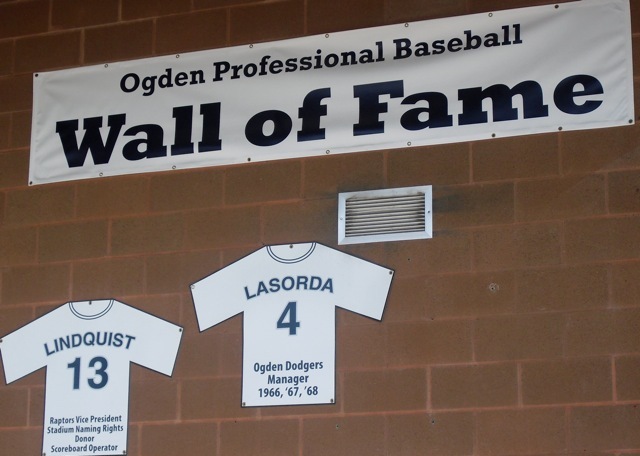 The first official days of the Tommy Lasorda championship managing era began in Ogden where Lasorda led the Ogden Dodgers to three consecutive Pioneer League titles in 1966, 1967 and 1968. Dodger careers of such players as Bill Buckner, Bill Russell, Charlie Hough, Steve Garvey, Bobby Valentine, Von Joshua, Sandy Vance and Tom Paciorek started in this northern Utah town under the tutelage of Lasorda. Tommy chronicled those years in his book, The Artful Dodger, where he tells stories of pitching hours of batting practice into the late hours to these players, converting Charlie Hough from a third baseman to a knuckleballer, playing a raw high school talent named Bobby Valentine at shortstop, and teaching his players at a young age to hate the Giant affiliate. One story I recall was that Peter O'Malley, (who then was in charge of minor league operations at the time) came out to watch the Ogden Dodgers play against the Giant affiliate and a huge brawl broke out. 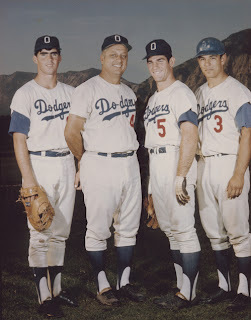 The way Lasorda told the story was that he had spent the entire season preaching that the Giants were the enemy and to hate them, even at the rookie league level. With his boss in the stands and the fight breaking out, Lasorda yelled at his team to "break it up," and to stop fighting. After the game, O'Malley asked a young Bill Buckner about the fight and what his manager tells him to do when a rhubarb breaks out. The young first baseman told him that their skipper instructed to keep fighting whenever he yelled "break it up." 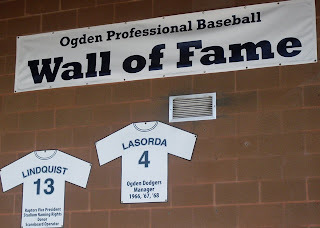 Without the Ogden success, it is doubtful that Lasorda would have ever arrived as the Hall of Fame manager that he became. 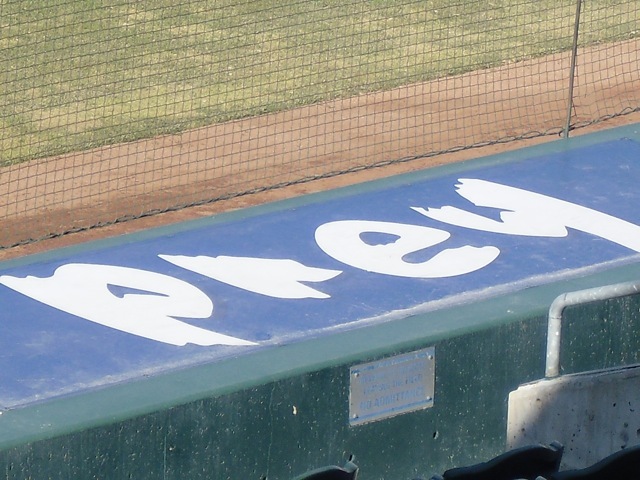 It was in those formative years that Lasorda not only proved that he could motivate and win, but also develop many players that arrived to the major league level. Fantastic ballpark and story. I would like to check it out someday. Thanks Evan. 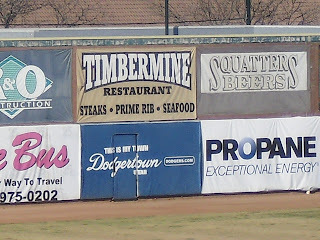 I look forward to visiting in the summer and actually seeing a game there. Thanks for reading. Great story Evan. 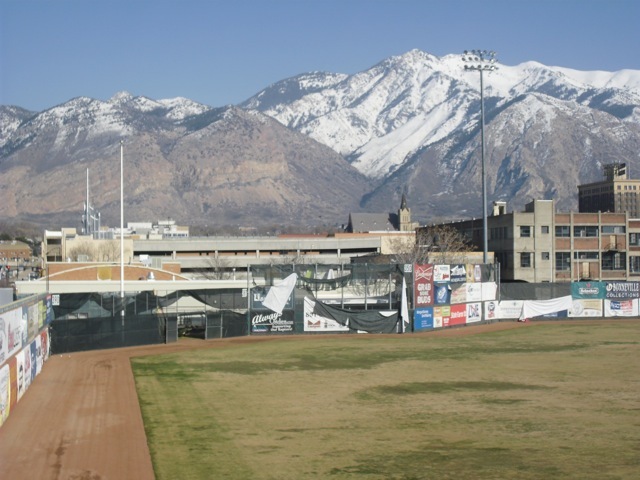 I follow all the Dodger affiliates very closely and had never seen a shot of the park in Ogden. What a beautiful setting. Good observation with Tommy. 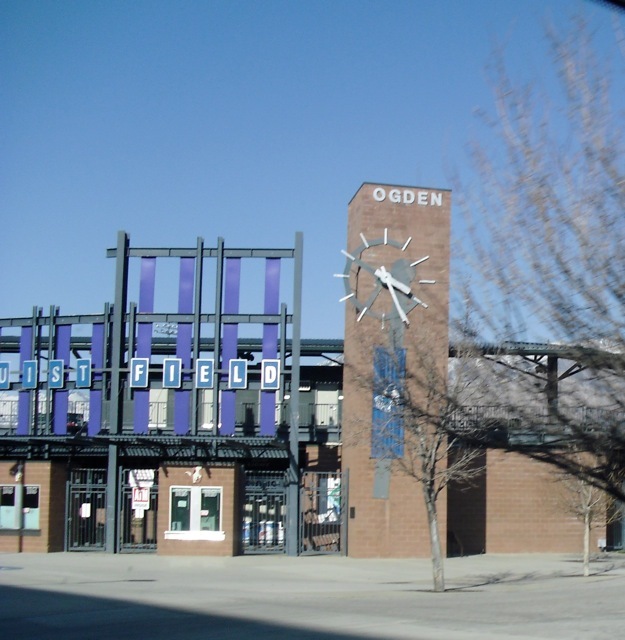 Ogden most likely was an important launching pad for him. He went right along with that group of players. How Will These Guys Get Playing Time? Holy Oblique Batman! Not the Upper Torso Again!